Go, go gadget! Protect your super gadgets by installing certified surge protectors. Share this photo to remind your friends that a simple home update can protect your home and its contents. Seek shelter. Lightning often hits before the rain begins, so don’t wait for the rain to start before leaving. Avoid water, high ground and open spaces. Stay away from metal objects including wires, fences and motors. Find shelter in a sizable building or in a fully enclosed metal vehicle like a car or truck. Completely close the windows and don’t lean on the doors. Don’t get under a small canopy, small picnic shelter or near trees. 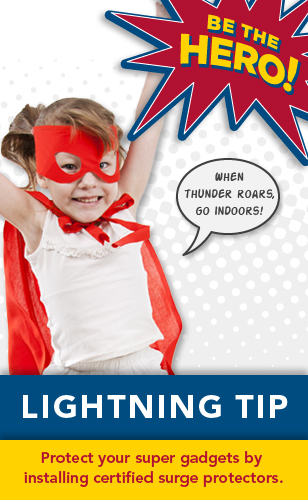 If you cannot take shelter indoors, crouch down with your feet together and place your hands over your ears to minimize hearing damage from the thunder. Stay at least 15 feet away from other people. Avoid water and stay away from doors and windows. Do not use landline telephone or headsets. Cell phones are safe. Turn off, unplug and stay away from appliances, computers, power tools and televisions sets as lightning may strike exterior electric and phone lines inducing shocks to equipment inside. Don’t resume activities until at least 30 minutes after the last lightning strike or thunderclap. Call 911 immediately if anyone is injured and use first aid procedures. Lightning victims do not carry an electrical charge, so it is safe to administer medical treatment. This entry was posted in Lightning by federalalliance. Bookmark the permalink.